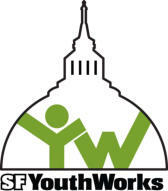 SF YouthWorks offers 11th and 12th grade high school students with paid internships in city government departments. Participants develop critical skills while exploring potential career paths with the guidance of city employee mentors. SF YouthWorks places students in over 30 San Francisco city departments. SF YouthWorks currently places interns in San Francisco City departments such as the Department of Public Health, the District Attorney’s office and the Board of Supervisors (for a full list of departments, see the SF YouthWorks website). SF YouthWorks 2012 Pine Street San Francisco, CA 94115 For more information, contact Mandy Au. Phone: (415) 202-7911 Fax: (415) 563-7137 Email: info@jcyc.org Website: www.SFYouthWorks.org SF YouthWorks offers 11th and 12th grade high school students with paid internships in city government departments. Participants develop critical skills while exploring potential career paths with the guidance of city employee mentors. SF YouthWorks places students in over 30 San Francisco city departments. SF YouthWorks currently places interns in San Francisco City departments such as the Department of Public Health, the District Attorney’s office and the Board of Supervisors (for a full list of departments, see the SF YouthWorks website).